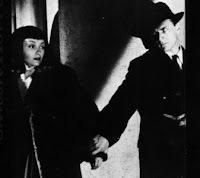 The Seventh Victim (The 7th Victim), a 1943 film produced by Val Lewton, was one of a string of hypnotic films noir he brought to the screen, coming right after Cat People, I Walked With a Zombie, and The Leopard Man. What makes this film i nteresting is the wide gulf separating its virtues and its flaws. The story concerns Mary, a young woman from a conservative boarding school, who decides to leave and go to New York to search for her missing older sister, Jacqueline, who has been her sole means of support. In New York she quickly learns that her missing sister has apparently sold her cosmetics factory (to an unfriendly, brusque colleague) and that Jacqueline had been secretly married to a man who is also looking for Jacqueline. Mary also meets a strange psychiatrist who has apparently been treating Jacqueline, and through him she learns that Jacqueline’s disappearance is linked to her membership in a Satanic cult of devil worshippers. It turns out that Jacqueline’s desire to flee from the cult was forbidden, and the cult members had decreed that she, like six earlier disenchanted members, must die for this betrayal. She is under the threat of becoming the seventh victim. Mary does eventually find Jacqueline and try to help her. In the meantime, though, Mary has attracted the romantic affections of both Jacqueline’s husband and a failed poet who is constantly quoting verse while trying to assist her to find Jacqueline. Although Jacqueline finally manages to get away from the cult, and also from an assassin she encounters on the street, she is unable to escape her own obsession with death. At the end of the film, she commits suicide by hanging herself in her room. Like most of the Lewton-produced films, there are no supernatural events or ghosts in the film; all events are grounded in this world. Nevertheless, the implausibility of the plot is the principal weakness of the film. Throughout the film, people appear and events take place without any justification. Many of the characters, particularly seemingly minor participants in the story, are bizarrely overplayed by the actors and actresses. And the romantic relationship between Jacqueline’s husband and the fresh-from-boarding-school Mary is completely far-fetched. In addition, the weird behaviour of the creepy psychiatrist provides further dislocation. Perhaps casting Tom Conway, brother of the super-smooth George Sanders, in the psychiatrist’s role induced Lewton and director Robson to unleash Conway’s thespian pyrotechnics, even though the role was minor. With these rather devastating flaws, one would assume that The Seventh Victim is completely irredeemable. But strangely, the film has a haunting quality that stays in one’s memory. Why is that? For one thing, the film comprises a set of brilliant set pieces, each of which holds together on its own. Even the opening sequence in the boarding school is eerie and claustrophobic in the extreme. In addition, there is the famous shower sequence, in which Mary is visited by her sister’s hostile colleague, who is seen in shadowy outline behind the shower screen. This scene is utterly compelling and stands high above the justifiably famous shower sequence from Hitchcock’s Psycho. There is also the dark scene depicting the devil-worshiping cult members trying to exert their will on Jacqueline. Because the tenets of their Satanic beliefs forbid them to carry out violent acts, they try to compel Jacqueline to commit suicide by exerting overwhelming peer pressure. Jacqueline almost succumbs, but manages to escape, only to fall prey to her own death fantasies at the end of the film. And finally, there is the bizarre sequence late in the film depicting Jacqueline walking on the city street late at night, after getting away from the cult members, and being followed by a mysterious assassin. Although this scene makes no sense, it has a disturbing quality that adds to the total effect. When these various set pieces accumulate, even though they don’t fit together neatly into a narrative whole, they give the film a disturbing, nightmarish quality, like seeing broken reflections in a fractured mirror. The individual characters are also dream-like in their characterisations. The Mary character, played by Kim Hunter in her first role, is one of complete virtue and innocence. She is basically a wide-eyed Alice wandering around in a dark, haunted Wonderland. Many of the other characters are emphatically willful and cynical, such as the boarding school headmistress, the new owner of Jacqueline cosmetic factory, and the chief cynic-in-residence, himself, the psychiatrist. All of them are creatures from your last nightmare. In contrast to Mary, who represents the innocence and vitality of youth and life, the Jacqueline character, whose delayed appearance doesn’t come until the latter stages of the film, represents the opposite ─ that of despair and the death wish. The closing act of suicide is not shown, but only signaled by an offscreen noise in the final shot of the film. It shows Jacqueline's neighbor, a dying woman in her last days who has decided to dress up and go out on the street for one final experience of the joy of life. As she passes in the hallway by Jacqueline's closed room door, one hears the sound of a chair beneath a hangman's noose (shown earlier in the film) being kicked over. For all of these things, The Seventh Victim is worth seeing and offers a good display of the Lewton company’s cinematic skills of dream weaving.